Lupus (systemic lupus erythematosus) is a condition in which antibodies attack your own tissues. These autoantibodies can attack nearly any tissues of the body, including blood vessels. Vasculitis is easier to understand by breaking the term down into "vascu" meaning related to blood vessels, and "itis" which means inflammation. Therefore, vasculitis is an inflammation of the blood vessels which occurs due to antibodies of the immune system attacking blood vessels. Vasculitis can affect any type of blood vessels; the arteries which carry blood from the heart to the tissues, the veins which return deoxygenated blood from the tissues to the heart, and the small single cell capillaries, the smallest of blood vessels through which the exchange of oxygen and carbon dioxide, as well as nutrients, takes place. Roughly 11 to 36 percent of people with lupus will develop vasculitis in some tissues and to some degree. Vasculitis can be a serious condition in a few different ways. Inflammation of the blood vessel can cause it become narrowed and result in a decreased flow of blood to the tissues the blood vessel serves. Sometimes blood vessels can close off completely. Other times, inflammation can cause blood vessels to stretch and weaken. The resulting aneurysms may then burst, causing internal bleeding and tissue damage. Lupus is but one cause of vasculitis, with autoantibodies in lupus damaging blood vessels. 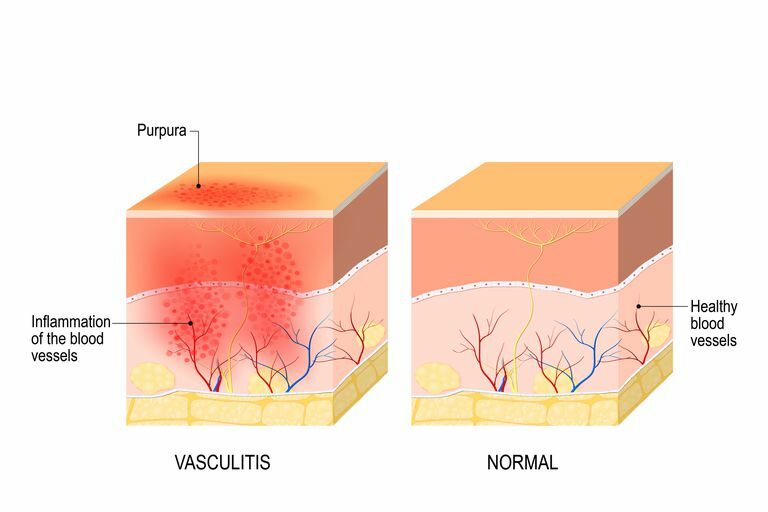 Vasculitis may also occur as result of an allergic reaction in the vessel walls or due to infection of the blood vessel walls. Typical symptoms of vasculitis should be familiar to people who suffer from inflammation: fever, swelling, malaise, and fatigue. But specific signs and symptoms often depend on where and what organ tissues blood vessels serve and the severity of the inflammation. Vasculitis affects some blood vessels in the body much more than others. For example, the kidneys are often affected in lupus, but vasculitis of the blood vessels in the kidneys is uncommon. The Heart - Symptoms related to vasculitis in the heart from lupus are uncommon, but may result in chest heaviness, especially that which comes on with exertion and is relieved by rest. The Lungs - Vasculitis of the lungs can cause fever, cough, and chest x-ray findings similar to pneumonia. It may also result in lung tissue scarring (fibrosis) and chronic shortness of breath. Mesenteric vasculitis - When the mesentery (the "blanket" of connective tissue which surrounds the abdominal organs) is affected, damage to the intestine may occur which can be thought of as an "intestinal stroke." Pulmonary hemorrhage - Involvement of larger blood vessels in the lungs can result in hemorrhage into lung tissue. Mononeuritis multiplex - Mononeuritis multiplex is an inflammation of two or more nerves that often causes deep, achy pain, and symptoms related to the affected nerves, such as foot drop. The diagnosis of vasculitis related to lupus can be challenging, and the same symptoms may occur due to vasculitis or other processes (direct effects of autoantibodies on tissues) found with lupus. Blood tests may look for non-specific signs of inflammation. Tests including a complete blood count, kidney function, and liver function tests are also done. Scans of the heart and brain (such as an echocardiogram or MRI angiography) may reveal aneurysms related to lupus. These lab and imaging studies are evaluated in conjunction with a careful history and physical exam to come up with the diagnosis of vasculitis. Sometimes a biopsy is done to determine whether tissue damage is related to vasculitis. Most forms of vasculitis are treatable if detected early before substantial organ damage has occurred. Corticosteroids and other immunosuppressive drugs are most often used to reduce the inflammation of blood vessels. Sometimes, when steroid medications are ineffective, medications such as those used for people with leukemia and lymphomas (for example, rituximab) may be helpful. To determine whether a person has vasculitis, a healthcare professional will review a patient’s medical history, conduct a physical exam and request some specialized lab tests, regardless of the type of vasculitis, including a complete blood count, urinalysis, and liver function tests. Most of the time, making the diagnosis and beginning treatment can reduce the inflammation in blood vessels associated with vasculitis. At times, however, the condition may result in serious complications, such as those related to the formation of aneurysms. While treatment can be effective, vasculitis is a chronic condition in which control, rather than cure, is the approach to management. Vasculitis related to lupus can result in a wide array of symptoms, as well as result in serious complications related to blood vessel narrowing and aneurysms. The diagnosis can be difficult and is usually made based on a combination of findings. While vasculitis is potentially very serious, immunosuppressive medications can frequently reduce the inflammation and may help to prevent some of the possible complications. Since early medical care can make a difference with lupus-related vasculitis, having a good relationship with your doctor and being your own advocate in your care can make a difference. Check out these tips on living your best with lupus day to day. Barile-Fabris, L., Hernandez-Cabrera, M., and J. Barragan-Garfias. Vasculitis in Systemic Lupus Erythematosus. Current Rheumatology Reports. 2014. 16(9):440. Shinjo, S., and E. Bonfa. Cutaneous Vasculitis in Systemic Lupus Erythematosus: Association with Anti-Ribosomal P Protein Antibody and Raynaud Phenomenon. Clinical Rheumatology. 2011. 30(2):173-7.